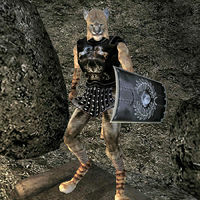 J'Hanir is a Khajiit of the Imperial Legion, in the official Siege at Firemoth plugin. He can be found in a hidden part of the Mines area below Fort Firemoth, behind a secret door in the Dungeon section of the Keep. (J'Hanir's hideout can also be reached from inside the main mine shaft, by Levitate or Jump.) Although an Archer by character class, he is armed with an Imperial Broadsword and uses an Imperial Shield and Cuirass. Aside from these, he has no possessions but Common Pants. Like all Khajiit, he can see well in the dark and can demoralize others for short periods; otherwise he knows no spells. He will tell you that he was left behind when the fort was overrun, and has managed to survive only by eating the mushrooms in the mine. J'Hanir will help you, as a follower NPC, to complete the last stage of the siege quest against the undead who have taken over the fort and surrounding islands – if you find him before killing the undead's lich boss, Grurn, in the tomb at the end of the other mine section. If you kill Grurn first, J'Hanir will be relieved to see you, but will not become a follower, and will simply remain in his mine hideout. Once J'Hanir is in follower mode, he will follow you until killed, unlike most followers in this game who stop following after a certain quest objective is reached. Other than his death, there is no way to stop him acting as a follower, though he is slow and can be outrun and left behind in a cell, like other follower NPCs. If you return to him, he'll follow again. If you take the ship back to Seyda Neen, J'Hanir (assuming he survived the lich encounter) will not go with you – the "sailing" is actually a special teleportation script in the game mechanics and is unlike the normal fast travel which brings random followers with you. If you wish to regroup with him, you will have to return to Firemoth by way of a fairly short manual sea crossing (or via Recall to a Mark you left at Firemoth) and bring him back to the mainland the hard way; there will not be another ship passage there or back. Note that he does not have Water Breathing ability, so it is best to swim and clear the path of hostile aquatic life on the way back out to the fort, and either swim at the surface or cast Water Walking on the both of you for the return trip to the mainland. If you turn over the Ward of Akavir (the shield artifact that is the Firemoth quest's tangible objective) to Sellus Gravius as instructed, J'Hanir is the only NPC added by Siege at Firemoth who will not then disappear from the game. Though a left-behind Legionnaire in the plot, J'Hanir is not coded as a member of the Imperial Legion or any other faction, and does not have Guard AI (e.g., cannot arrest you for a bounty). One supposes that his enlistment period has expired in the time elapsed since Firemoth's undead invasion. Roleplay: If you wish to reunite him with the Legion, and have him stop following you before he gets killed, it is a simple matter to lead him into any official Imperial building you don't need to return to (e.g. a fort tower, or the Seyda Neen Census and Excise Office Warehouse) and then leave fast enough that he can't follow you. You can prevent him ever following again with firemoth_cat->AIWander,0,0,0 in the Console. This page was last modified on 19 October 2018, at 21:39.